Leigh Art Trail Silent Auction is opportunity to bag a bargain! New this year: Silent Auction! Get bidding! Your chance to bid for beautiful artwork throughout the Trail. In each venue there is a piece being auctioned. Place a silent bid in the following way. The auction runs for the duration of the Trail, closing on the last Saturday 17 June at 2pm. Winning bidders will then be notified and arrangements made for collection and payment. In the event of a tie, names will be drawn out of a hat. Proceeds from the auction will go towards the running of the Trail and LAT will make a donation to a local charity that uses the arts to support individuals living with dementia. Photos of the auction items can be viewed by clicking here. Or viewed below. Bigger and Better! 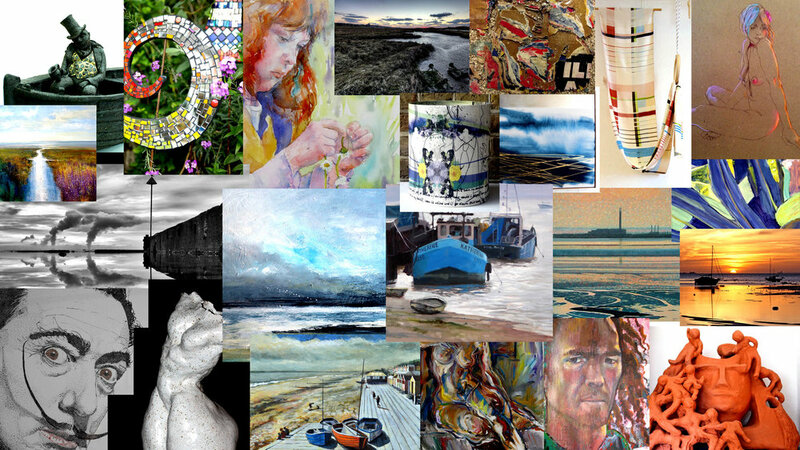 Leigh Art Trail is back for its 20th year! The annual Leigh Art Trail has become an important part of the town’s cultural calendar. Now in its 20th year, the 2017 event is being held from Saturday 10th – 17th June, and will showcase the talents of over 70 selected artists and designer-makers in around 55 venues in this little corner of Essex. In what has now become typical art-trail tradition, in the region of 15,000 visitors will be able to view the work free of charge in the makers’ studios, local galleries, shops and restaurants. The amazing diversity of work includes painting, sculpture, ceramics, textiles, photography, printmaking and jewellery produced by artists living and working in Leigh and the surrounding area. This year sees the return of Sculpture Street, a community project where for one weekend only (June 10th-11th) an ordinary quiet residential street in the town will be transformed into a street of inspiration, showcasing artists work in the residents gardens. The launch event of the trail is on 8th June with many other activities during the week including guided walks, performances and artists workshops. So don’t miss out pick up a brochure or check out the trail guide here.